August 23, 2018 - Kirkland, Washington, USA - Silicon Designs, Inc., a 100% veteran owned, U.S. based leading designer and manufacturer of rugged industrial-grade MEMS variable capacitive (MEMS VC) accelerometer chips, modules, and supporting data acquisition, today announced that it is now offering MEMS VC accelerometer module samples, in ranges from ±2 g to ±100 g, via Amazon.com. This newly established Amazon offering will allow Silicon Designs to efficiently distribute MEMS VC accelerometer samples to its customers, 24 hours per day, 7 days per week, from anywhere in the world. In parallel, Silicon Designs looks forward to continuing to offer via the factory, larger quantities and higher-g ranges of its standard and custom MEMS VC accelerometer modules, including the new Model 2422H Series specialty hermetic line; standard and custom MEMS JCC/LCC chips with integrated amplification; and supporting data acquisition. All products are 100% designed, developed and manufactured in-house at Silicon Designs’ global corporate headquarters, located just outside of Seattle, Washington, USA. They are further supported by an extensive worldwide sales and distribution network. Low-cost MEMS VC accelerometer modules from Silicon Designs are offered in standard ranges from ±2 g to ±400 g. On-board voltage regulation and an internal reference minimize temperature and voltage changes, while eliminating additional external power regulation requirements. Series units are relatively insensitive to wider temperature changes and gradients. Carefully regulated manufacturing processes ensure that each Silicon Designs MEMS VC accelerometer is manufactured to virtually identical performance standards, allowing users to swap out parts in the same g-range with few-to-no testing modifications, saving time and resources. This also allows for a quick plug-and-play solution for almost any application, with total trust in sensor accuracy when used within published specifications. In addition, as the OEM of its own MEMS accelerometer chips and modules, Silicon Designs can ensure that all products are of uniform high-quality; may be easily customized to exacting standards; and are still available with short lead times and the industry’s best price-for-performance ratio. 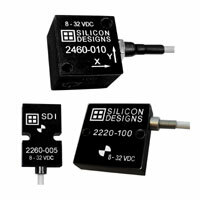 For more information about MEMS VC accelerometers and chips from Silicon Designs, visit www.SiliconDesigns.com.